For other uses, see Deptford (disambiguation). Deptford /ˈdɛtfəd/, an area on the south bank of the River Thames in south-east London, is named after a ford of the River Ravensbourne. From the mid 16th century to the late 19th it was home to Deptford Dockyard, the first of the Royal Dockyards. This was a major shipbuilding dock and attracted Peter the Great to come and study shipbuilding. Deptford and the docks are associated with the knighting of Sir Francis Drake by Queen Elizabeth I aboard the Golden Hind, the legend of Sir Walter Raleigh laying down his cape for Elizabeth, Captain James Cook's third voyage aboard Resolution, and the mysterious murder of Christopher Marlowe in a house along Deptford Strand. Though Deptford began as two small communities, one at the ford, and the other a fishing village on the Thames, Deptford's history and population has been mainly associated with the docks established by Henry VIII. The two communities grew together and flourished; the docks were the main administrative centre of the Royal Navy, and some grand houses like Sayes Court, home to diarist John Evelyn, and Stone House on Lewisham Way, were erected. The area declined as first the Royal Navy moved out, and then the commercial docks themselves declined until the last dock, Convoys Wharf, closed in 2000. A Metropolitan Borough of Deptford was formed in 1900; then, in 1965, the area became part of the newly created London Borough of Lewisham to which it still belongs. Deptford began life as a ford of the Ravensbourne (near what is now Deptford Bridge DLR station) along the route of the Celtic trackway which was later paved by the Romans and developed into the medieval Watling Street. The modern name is a corruption of "deep ford". Deptford was part of the pilgrimage route from London to Canterbury used by the pilgrims in Chaucer's Canterbury Tales, and is mentioned in the Prologue to the "Reeve's Tale". The ford developed into first a wooden then a stone bridge, and in 1497 saw the Battle of Deptford Bridge, in which rebels from Cornwall, led by Michael An Gof, marched on London protesting against punitive taxes, but were soundly beaten by the King's forces. A second settlement, Deptford Strand, developed as a modest fishing village on the Thames until Henry VIII used that site for a royal dock repairing, building and supplying ships, after which it grew in size and importance, shipbuilding remaining in operation until March 1869. Trinity House, the organisation concerned with the safety of navigation around the British Isles, was formed in Deptford in 1514, with its first Master being Thomas Spert, captain of the Mary Rose. It moved to Stepney in 1618. The name "Trinity House" derives from the church of Holy Trinity and St Clement, which adjoined the dockyard. Originally separated by market gardens and fields, the two areas merged over the years, with the docks becoming an important part of the Elizabethan exploration. Queen Elizabeth I visited the royal dockyard on 4 April 1581 to knight the adventurer Francis Drake. As well as for exploration, Deptford was important for trade - the Honourable East India Company had a yard in Deptford from 1607 until late in the 17th century, later (1825) taken over by the General Steam Navigation Company. It was also connected with the slave trade, John Hawkins using it as a base for his operations, and Olaudah Equiano, the slave who became an important part of the abolition of the slave trade, was sold from one ship's captain to another in Deptford around 1760. Surviving riverside building of the former Royal Victoria Victualling Yard. Diarist John Evelyn lived in Deptford at Sayes Court from 1652. Evelyn inherited the house when he married the daughter of Sir Richard Browne in 1652. On his return to England at the Restoration, Evelyn laid out meticulously planned gardens in the French style, of hedges and parterres. In its grounds was a cottage at one time rented by master woodcarver Grinling Gibbons. After Evelyn had moved to Surrey in 1694, Russian Tsar Peter the Great studied shipbuilding for three months in 1698. He and some of his fellow Russians stayed at Sayes Court, the manor house of Deptford. Evelyn was angered at the antics of the Tsar, who got drunk with his friends and, using a wheelbarrow with Peter in it, rammed their way through a fine holly hedge. Sayes Court was demolished in 1728-9 and a workhouse built on its site. Part of the estates around Sayes Court were purchased in 1742 for the building of the Navy Victualling Yard, which was renamed the Royal Victoria Victualing Yard in 1858 after a visit by Queen Victoria. This massive facility included warehouses, a bakery, a cattleyard/abattoir and sugar stores, and closed in 1961. All that remains is the name of Sayes Court Park, accessed from Sayes Court Street off Evelyn Street, not far from Deptford High Street. The Pepys Estate, opened on 13 July 1966, is on the former grounds of the Victualing Yard. The Docks had been gradually declining from the 18th century; the larger ships being built found The Thames difficult to navigate, and Deptford was under competition from the new docks at Plymouth, Portsmouth and Chatham. When the Napoleonic Wars ended in 1815 the need for a Docks to build and repair warships declined; the Docks shifted from shipbuilding to concentrate on victualling at the Royal Victoria Victualling Yard, and the Royal Dock closed in 1869. From 1871 until the First World War the shipyard site was the City of London Corporation's Foreign Cattle Market, in which girls and women butchered sheep and cattle until the early part of the 20th century. [nb 1] At its peak, around 1907, over 234,000 animals were imported annually through the market, but by 1912 these figures had declined to less than 40,000 a year. The yard was taken over by the War Office in 1914, and was an Army Supply Reserve Depot in the First and Second World Wars. The site lay unused until being purchased by Convoys (newsprint importers) in 1984, and eventually came into the ownership of News International. In the mid-1990s, although significant investment was made on the site, it became uneconomic to continue using it as a freight wharf. In 2008 Hutchison Whampoa bought the 16ha site from News International with plans for a £700m 3,500-home development scheme. The Grade II listed Olympia Warehouse will be refurbished as part of the redevelopment of the site. Deptford experienced economic decline in the 20th century with the closing of the docks, and the damage caused by the bombing during the Second World War - a V-2 rocket destroyed a Woolworths store (now New Cross Gate), killing 160 people. High unemployment caused some of the population to move away as the riverside industries closed down in the late 1960s and early 1970s. The local council have developed plans with private companies to regenerate the riverside area, and the town centre. The Manor of Deptford or West Greenwich was bestowed by William the Conqueror upon Gilbert de Magminot or Maminot, bishop of Lisieux, one of the eight barons associated with John de Fiennes for the defence of Dover Castle. Maminot held the head of his barony at Deptford and according to John Lyon writing in 1814, he built himself a castle, or castellated mansion at Deptford, of which all traces had by then long since been buried in their ruins, but from the remains of some ancient foundations which had been discovered the site was probably on the brow of Broomfield, near the Mast Dock and adjacent to Sayes Court. Originally under the governance of the ancient parishes of St Paul and St Nicholas, in 1900, a Metropolitan Borough of Deptford was formed out of the southern parish of St Paul, with St Nicholas and the area around the Royal Dockyard coming under the governance of the Metropolitan Borough of Greenwich. Under the London Government Act 1963, the Metropolitan Borough of Deptford was absorbed in 1965 into the newly created London Borough of Lewisham, with the area around the Royal Dockyard being transferred to Lewisham in a 1994 boundary adjustment of about 40 hectares (99 acres). The electoral wards consist of Evelyn in the north and part of New Cross to the south. Deptford borders the areas of Brockley and Lewisham to the south, New Cross to the west and Rotherhithe to the north west; Deptford Creek divides it from Greenwich to the east, and the River Thames separates the area from the Isle of Dogs to the north east; it is contained within the London SE8 post code area. The area referred to as North Deptford is the only part of the London Borough of Lewisham to front the Thames and is sandwiched between Rotherhithe and Greenwich. Much of this riverside estate is populated by the former Naval Dockyards, now known as Convoys Wharf, the Pepys Estate and some eastern fringes of the old Surrey Commercial Docks. The name Deptford — anciently written Depeford meaning "deep ford" — is derived from the place where the road from London to Dover, the ancient Watling Street (now the A2), crosses the River Ravensbourne at the site of what became Deptford Bridge at Deptford Broadway. The Ravensbourne crosses under the A2 at roughly the same spot as the Docklands Light Railway (DLR) crosses over; and at the point where it becomes tidal, just after Lewisham College, it is known as Deptford Creek, and flows into the River Thames at Greenwich Reach. Deptford was mostly located in the Blackheath Hundred of the county of Kent, with the Hatcham part in Surrey. It was regarded as two parts and in 1730 was divided into the two parishes of St Nicholas in the north and St Paul in the south. The southern part by the ford was known as Deptford and the northern, riverside area was known as Deptford Strand. It was also referred to as West Greenwich, with the modern town of Greenwich being referred to as East Greenwich until this use declined in the 19th century. The whole of Deptford came within the Metropolitan Police District in 1830 and was included in the area of responsibility of the Metropolitan Board of Works in 1855. It was transferred to the County of London in 1889 and became part of Greater London in 1965. The area was split in 1900: the southern part, the parish of St Paul Deptford, became the Metropolitan Borough of Deptford; while the northern part, the parish of St Nicholas Deptford, became part of the Metropolitan Borough of Greenwich. In 1965 the Metropolitan Borough of Deptford was absorbed into the London Borough of Lewisham, then in 1994 the bulk of the northern part, including the former Royal Dockyard area, was transferred to Lewisham Borough from Greenwich Borough, leaving only the north eastern area, around St Nicholas's church, in Greenwich. Deptford's population has been mainly associated with the docks since the establishment of the Royal Docks by Henry VIII, though there has also been some market gardening and potteries. When the docks were thriving as the main administrative centre of the British Navy, so the area prospered, and fine houses were built for the administrative staff and the skilled shipbuilders, and a few grand houses like Sayes Court and Stone House on Lewisham Way were erected. There was a start of a demographic shift downwards when the Royal Navy pulled out of Deptford, and the docks moved into storage and freight. The downward shift continued into the 20th century as the local population's dependency on the docks continued: as the docks themselves declined, so did the economic fortune of the inhabitants until the last dock, Convoys Wharf, closed in 2000. Deptford's northern section nearest the old docks contains areas of council housing, with some concentrations of people experiencing the forms of deprivation typically associated with the poverty of Inner London. Northern Deptford near the Thames, along with neighbouring New Cross, has been touted as "the new Shoreditch" by some journalists and estate agents paying attention to a trendy arts and music scene that is popular with students and artists. To the south where Deptford rolls into the suburban spread of Brockley, the previously multi-occupancy Victorian houses are being gentrified by young city workers and urban professionals. Deptford has a growing Vietnamese community reflected in the number of restaurants in the area. Deptford contains a number of student populations, including those of Goldsmiths College, the University of Greenwich, Bellerbys College and Laban Dance Centre. Goldsmiths College's hall of residence, Rachel McMillan, in Creek Road was sold in 2001 for £79 million, and was subsequently demolished and replaced with the McMillan Student Village which opened in 2003 and provides accommodation for approximately 970 students of the University of Greenwich, Trinity Laban and Bellerbys colleges. Deptford's economic history has been strongly connected to the Dockyard - when the Dockyard was thriving, so Deptford thrived; with the docks now all closed, Deptford has declined economically. However, areas of Deptford are being gradually re-developed and gentrified - and the local council has plans to regenerate the riverside and the town centre. A large former industrial site by the Thames called Convoys Wharf is scheduled for redeveloping into mixed use buildings. This will involve the construction of around 3,500 new homes and an extension of the town centre northwards towards the river. The site of a former foundry (established in 1881 by J. Stone & Co in Arklow Road) which closed in 1969 is being redeveloped for commercial and residential use. Much of the area along Creek Road, close to Greenwich, has also been redeveloped, with the demolition of the old Deptford Power Station and Rose Bruford College buildings. Aragon Tower on the Pepys Estate was sold by Lewisham Borough to fund regeneration plans for the estate; the award-winning refurbishment into privately owned accommodation was featured in the BBC One documentary, "The Tower". Deptford Market, a street market in Deptford High Street sells a range of goods, and is considered one of London's liveliest street markets. In February 2005, the High Street was described as "the capital's most diverse and vibrant high street" by Yellow Pages business directory, using a unique mathematical formula. The Albany Theatre, a community arts centre with a tradition of "radical community arts and music" including holding 15 "Rock Against Racism" concerts, has its roots in a charity established in 1894 to improve the social life of Deptford's deprived community. The original building, the Albany Institute, was opened in 1899 on Creek Road, changing its name in the 1960s to the Albany Empire. It was burnt down in 1978, but rebuilt on Douglas Way, with Prince Charles laying the foundation stone, and Diana, Princess of Wales opening it in 1982. Deptford Cinema is a volunteer run, not-for-profit, community cinema, art gallery, and occasional music venue, open since late 2014 and located at 39 Deptford Broadway. At the time of opening it was the borough of Lewisham's only functioning cinema. Creekside, a regeneration area beside Deptford Creek, is used for educational and artistic purposes, such as the Laban Dance Centre, which was designed by Swiss architects Jacques Herzog and Pierre de Meuron, and opened in February 2003; and the Art in Perpetuity Trust (APT) gallery and studio space. A record label, Deptford Fun City Records was set up by Miles Copeland III, brother of Stewart Copeland, in the late 1970s as an outlet for Deptford bands such as Alternative TV and Squeeze. The area has several pubs, including the Dog & Bell which has a reputation for serving a range of cask ales; and The Bird's Nest which has live music, film and art performances from local bands and artists. The town hall of the former Metropolitan Borough of Deptford, built in 1905 with decorative sculpture by Henry Poole, lies just outside Deptford, on the New Cross Road in New Cross. It was purchased by Goldsmiths College in 2000. There are several green spaces in the area, the largest being Brookmill Park, Deptford Park, Ferranti Park, Pepys Park and Sayes Court Park. In 1884 William John Evelyn, a descendant of John Evelyn, sold ground then being used as market gardens in Deptford, to the London County Council for less than its market value, as well as paying toward the cost of its purchase. It was officially opened to the public as Deptford Park on 7 June 1897. In 1886, he dedicated an acre and a half of the Sayes Court recreation ground in perpetuity to the public and a permanent provision was made for the Evelyn estate to cover the expense of maintenance and caretaking, this was opened on 20 July 1886. Deptford is served by National Rail and Docklands Light Railway services. The National Rail service is operated by Southeastern and Thameslink on the suburban Greenwich Line at Deptford railway station, the oldest passenger only railway station in London, and St Johns, as well as nearby New Cross and New Cross Gate stations. The DLR stations are at Deptford Bridge and Elverson Road. Deptford station has been redeveloped and reopened in 2012. The works included the demolition of the existing, dilapidated, station building and its replacement by a glass and steel structure and refurbished platforms. Since May 2010, New Cross station has also been served by London Overground services to Dalston Junction, after the East London Line reopened as part of the National Rail network. Nearby New Cross Gate railway station is also served by London Overground trains northbound to Highbury and Islington, and southbound to Crystal Palace and West Croydon. The two main road routes through Deptford are the A200 which runs along Evelyn Street and Creek Road, and the A2 which runs along New Cross Road. The A20 marks the southern boundary of the area, along Lewisham Way and Loampit Vale. Since June 2016, Deptford has been on the cycling route of the London Quietway route Q1 that starts in Greenwich and ends near Waterloo Bridge in central London. A second Quietway route, Q14, between Waterloo to Thamesmead, will pass through Deptford's riverfront from mid to late 2018. There are five primary schools scattered around the area, with four ranging from "good" to "outstanding" in recent Ofsted reports (the fifth recently became an Academy). There are no local secondary schools directly in Deptford, however there are two secondary schools near the border between New Cross and Deptford: Deptford Green, regarded by Ofsted as "needing improvement", and Addey and Stanhope, regarded by Ofsted as "good". A branch of the further education college, Lewisham College incorporating Southwark College (known as LeSoCo), is located on Deptford Church Street; the college was regarded as "inadequate" in the 2014 Ofsted inspection. Deptford railway station is one of the oldest suburban stations in the world, being built (c.1836-38) as part of the first suburban service (the London and Greenwich Railway), between London Bridge and Greenwich. Close to Deptford Creek is a Victorian pumping station built in 1864, part of the massive London sewerage system designed by civil engineer Sir Joseph Bazalgette. The former Deptford Power Station, in use from 1891 to 1983, originated as a pioneering plant designed by Sebastian de Ferranti, which when built was the largest station in the world. In 2008, Lewisham Council granted permission for the last remnants of the Deptford Ragged School known as The Princess Louise Institute to be demolished and replaced by flats. Albury Street (previously Union Street) contains a fine row of early urban houses largely dating from 1705 to 1717 which were once popular with naval captains and shipwrights. Tanners Hill in the St John's or New Deptford area to the south of New Cross Road, is part of an Area of Archaeological Priority due to the longevity of settlement and early industry, and contains a set of commercial buildings from numbers 21 to 31 which are survivors from a row of 31 which were built in the 1750s on the site of cottages dating from the 17th century. These timber-frame buildings have a Grade II listing from English Heritage and are home to established businesses such as bicycle maker Witcomb Cycles. Of Deptford's two important houses, Sayes Court no longer exists, but the Stone House in St Johns, built around 1772 by the architect George Gibson the Younger, and described by Pevsner as "the one individual house of interest in this area", still stands by Lewisham Way. Deptford's Albany Theatre has a history stretching back over 100 years and is a prominent feature of the South-East London arts scene. St Nicholas' Church, the original parish church, dates back to the 14th century but the current building is 17th century. The entrance to the churchyard features a set of skull-and-bones on top of the posts. A plaque on the north wall commemorates playwright Christopher Marlowe, who was murdered in a nearby house, and buried in an unmarked grave in the churchyard on 1 June 1593. There is also St. Luke's, another historic circular church, dating from 1870. It is the daughter church of the parish of St Nicholas'. In the 18th century St. Paul's, Deptford (1712–1730) was built, acclaimed by the Royal Commission on the Historical Monuments of England as one of the finest Baroque churches in the country. John Betjeman is attributed as referring to the church as "a pearl at the heart of Deptford". It was designed by the architect Thomas Archer, who was a pupil of Sir Christopher Wren, as part of the Commission for Building Fifty New Churches with the intention of instilling pride in Britain, and encouraging people to stay in London rather than emigrate to the New World. Adjacent to the church yard is Albury Street, which contains some fine 18th-century houses which were popular with sea captains and shipbuilders. Painting of Deptford Dockyard in 1747 by John Cleveley the Elder. National Maritime Museum. Deptford Dockyard was established in 1513 by Henry VIII as the first Royal Dockyard, building vessels for the Royal Navy, and was at one time known as the King's Yard. It was shut down from 1830 to 1844 before being closed as a dockyard in 1869, and is currently known as Convoys Wharf. From 1871 until the First World War it was the City of London Corporation's Foreign Cattle Market. In 1912, The Times reported that over 4 million head of live cattle, and sheep, had been landed. From 1932 until 2008 the site was owned by News International, which used it to import newsprint and other paper products from Finland until early 2000. It is now owned by Hutchison Whampoa Limited and is subject to a planning application to convert it into residential units, though it has safeguarded wharf status. Other notable shipyards in Deptford were, Charles Lungley's Dockyard and the General Steam Navigation Company's yards at Deptford Green and Dudman's Dock, also sometimes referred to as Deadmans Dock at Deptford Wharf. The Elizabethan playwright Christopher Marlowe was killed during an alleged drunken brawl in Eleanor Bull's house in Deptford Strand in May 1593. Various versions of Marlowe's death were current at the time. Francis Meres says Marlowe was "stabbed to death by a bawdy serving-man, a rival of his in his lewd love" as punishment for his "epicurism and atheism". In 1917, in the Dictionary of National Biography, Sir Sidney Lee wrote that Marlowe was killed in a drunken fight. Some modern theories posit that he was assassinated. It is commonly assumed that the fight took place in a Deptford tavern. The scholar Leslie Hotson discovered in 1925 the coroner's report on Marlowe's death in the Public Record Office which gave fuller details. Marlowe had spent all day in a house owned by the widow Eleanor Bull, along with three men, Ingram Frizer, Nicholas Skeres and Robert Poley. Witnesses testified that Frizer and Marlowe had earlier argued over the bill, exchanging "divers malicious words." Later, while Frizer was sitting at a table between the other two and Marlowe was lying behind him on a couch, Marlowe snatched Frizer's dagger and began attacking him. In the ensuing struggle, according to the coroner's report, Marlowe was accidentally stabbed above the right eye, killing him instantly. The jury concluded that Frizer acted in self-defence, and within a month he was pardoned. Marlowe was buried in an unmarked grave in the churchyard of St Nicholas, Deptford, on 1 June 1593. Among people associated with Deptford are Christopher Marlowe, who was murdered at Deptford Strand; diarist John Evelyn (1620–1706), who lived at Sayes Court, and had Peter the Great (1672–1725) as a guest for about three months in 1698; and Sir Francis Drake who was knighted by Queen Elizabeth I aboard the Golden Hind in Deptford Docks. Other people who have lived in Deptford, range from the first governor of the East India Company, and ambassador to the court of Russia, Thomas Smythe, whose magnificent house was destroyed by fire in 1618; to early members of the Chartist movement, John Gast and George Julian Harney; and the Cleveleys, John Cleveley the Elder and his sons John and Robert, a family of marine artists who also worked as tradesmen in the Dockyard. Another artist born in Deptford is Henry Courtney Selous, who is known for The Opening of The Great Exhibition, painted in 1851. Members of rock groups Squeeze and Dire Straits lived on the Crossfield Estate in Deptford in the late 1970s, along with Mark Perry, founder of the punk fanzine Sniffin Glue and punk rock band Alternative TV. The DJ and music journalist Danny Baker lived near the Crossfield Estate, where he was born and brought up. ^ Greenwich 2000 (2010-01-05). "Greenwich England: Deptford". Wwp.greenwich2000.com. Retrieved 2010-07-05. ^ Dartford Grammar School. "Roman and Saxon Roads and Transport". dartfordarchive.org.uk. Kent County Council. ^ Hanks, Patrick; Hodges, Flavia; Mills, A. D.; Room, Adrian (2002). The Oxford Names Companion. Oxford: the University Press. p. 1003. ISBN 978-0198605614. ^ The environs of London: being an ... - Google Books. 1811. Retrieved 29 December 2009. ^ Moorhouse, Geoffrey (2005). Great Harry's Navy. London: Weidenfeld & Nicolson. pp. 169, 170. ISBN 978-0-297-64544-3. ^ "Deptford". www.ideal-homes.org.uk. Archived from the original on 1 June 2008. Retrieved 17 August 2008. ^ "The Tudor and Stuart port - About maritime London - Port Cities". www.portcities.org.uk. Archived from the original on 22 December 2008. Retrieved 9 January 2010. ^ "The East India Company's Yard at Deptford". Portcities.org.uk. Retrieved 5 July 2010. ^ "Slavetrade in the caribbean, from the beginning till abolishment". www.paradise-inn-carriacou.com. Archived from the original on 12 April 2010. Retrieved 9 January 2010. ^ "Olaudah Equiano, UK". www.itzcaribbean.com. Archived from the original on 13 October 2008. Retrieved 9 January 2010. ^ a b c d Deptford, St Nicholas, The Environs of London: volume 4: Counties of Herts, Essex & Kent (1796), pp. 359-85. Retrieved 19 September 2009. ^ "Deptford & Millwall - add info". London-footprints.co.uk. Retrieved 5 July 2010. ^ "Pepys Estate Tenants Action Group". ^ "Deptford and Woolwich: London's Royal Dockyards - London's docks and shipping - Port Cities". www.portcities.org.uk. Retrieved 14 January 2010. ^ a b "Deptford and Woolwich: London's Royal Dockyards - London's docks and shipping - Port Cities". www.portcities.org.uk. Retrieved 14 January 2010. ^ "The New Foreign Cattle Market, the Central Shed, Deptford". www.bl.uk. Retrieved 19 December 2009. ^ "Sir Wilfred Grenfell College -". www.swgc.mun.ca. Retrieved 19 December 2009. ^ "Mothballed £700m Deptford housing scheme on track | Magazine News". Building. 6 November 2009. Retrieved 5 July 2010. ^ local knowledge - the Woolworth store referred to here was opened in the 50's. The one destroyed in the War was in New Cross Gate half a mile away. ^ Crawshaw, Steve (2004). Easier fatherland: Germany and the ... - Google Books. ISBN 978-0-8264-6320-3. Retrieved 14 January 2010. ^ "FlyingBombsandRockets,V1,V2,Rockets,Flying bombs". www.flyingbombsandrockets.com. Archived from the original on 14 December 2012. Retrieved 15 January 2010. ^ a b "About Deptford Town Centre » Deptford TownTalk". www.deptford.towntalk.co.uk. Archived from the original on 1 January 2013. Retrieved 14 January 2010. ^ a b "Concept". www.richardrogers.co.uk. Archived from the original on 3 October 2009. Retrieved 19 December 2009. ^ a b "Lewisham Council - Proposals for the regeneration of Deptford town centre". www.lewisham.gov.uk. Retrieved 14 January 2010. ^ a b Lyon, John (1814). The history of the town and port of Dover and of Dover castle by John Lyon, published 1814, p. 139. Retrieved 5 July 2010. ^ Ireland, William Henry (1830). England's topographer, or A new and complete history of the county of Kent by William Henry Ireland, 1830, page 731. Retrieved 5 July 2010. ^ "About the Area". neighbourhood.statistics.gov.uk. Retrieved 29 December 2009. ^ "Location of Deptford telephone exchange". www.streetmap.co.uk. Retrieved 29 December 2009. ^ "Deptford Creek - About maritime London - Port Cities". www.portcities.org.uk. Archived from the original on 3 March 2009. Retrieved 19 December 2009. ^ "Historical Maps of Lewisham". Ideal-homes.org.uk. Archived from the original on 1 May 2009. Retrieved 5 July 2010. ^ "The History and Topographical Survey of the County of Kent: Volume 1 (1797), pp. 340-71". British-history.ac.uk. 22 June 2003. Retrieved 5 July 2010. ^ Great Britain Historical GIS / University of Portsmouth, Deptford MB (historic map). Retrieved 4 August 2008. ^ Great Britain Historical GIS / University of Portsmouth, Deptford St Nicholas (historic map). Retrieved 4 August 2008. ^ "St John's, Deptford New Town Case Study". www.ideal-homes.org.uk. Archived from the original on 10 April 2008. Retrieved 17 August 2008. ^ "Lewisham Deptford". ukpollingreport.co.uk. Retrieved 5 July 2010. ^ "McMillan Student Village". Accommodation - University of Greenwich. www.gre.ac.uk. Archived from the original on 22 August 2009. Retrieved 29 December 2009. ^ "Deptford Foundry, Arklow Road". Turley. Archived from the original on 3 April 2018. Retrieved 3 April 2018. ^ "Television: Kathryn Flett on Paris". The Observer. London: guardian.co.uk. 1 July 2007. Retrieved 19 December 2009. ^ "2006 - Berkeley Homes". www.berkeleyhomes.co.uk. Retrieved 19 December 2009. ^ "London's Best Markets - Time Out London". www.timeout.com. Archived from the original on 15 September 2008. Retrieved 16 August 2008. ^ Yell Group, Deptford is Top of the Shops - New study reveals London’s hidden gems in the High Street Hit Parade, 23 February 2005. ^ Gilchrist, Ruth; Jeffs, Tony (March 2001). Settlements, social change and ... - Google Books. ISBN 978-1-85302-764-2. Retrieved 19 December 2009. ^ a b "The Albany – Get Involved: Albany History". www.thealbany.org.uk. Archived from the original on 28 November 2009. Retrieved 19 December 2009. ^ Hennings, Emily (17 February 2018). "5 independent cinemas in SE London perfect for a date or great night out". News Shopper. London: Newsquest. Retrieved 11 April 2018. ^ Hough, Michael (15 June 2004). Cities and natural process: a basis ... - Google Books. ISBN 978-0-415-29854-4. Retrieved 29 December 2009. ^ "Creekside - About Creekside". www.creeksidecentre.org.uk. Archived from the original on 28 March 2010. Retrieved 29 December 2009. ^ "Creekside Artists". Deptford, South East London, UK: www.creeksideartists.co.uk. Retrieved 29 December 2009. ^ "APT - Art in Perpetuity Trust". www.aptstudios.org. Retrieved 29 December 2009. ^ Sabin, Roger (1999). Punk rock: so what? : the cultural ... - Google Books. ISBN 978-0-415-17029-1. Retrieved 8 January 2010. ^ Paul Marko Borthwick, Stuart; Moy, Ron (2004). Popular music genres: an introduction - Google Books. ISBN 978-0-7486-1745-6. Retrieved 8 January 2010. ^ The Roxy London Wc2: A Punk History. The Roxy Club London:Punk. 15 October 2007. ISBN 978-0-9556583-0-3. Retrieved 8 January 2010. ^ "Dog & Bell - Deptford - Review - Time Out London". www.timeout.com. Archived from the original on 3 October 2009. Retrieved 11 January 2010. ^ "Dog and Bell, Deptford, London pub guide". fancyapint?. Archived from the original on 27 May 2010. Retrieved 11 January 2010. ^ "The Bird's Nest, Deptford, London pub guide". fancyapint?. Archived from the original on 20 February 2010. Retrieved 11 January 2010. ^ "DEPTFORD ARMS - Open Mic & Open To Art". Artrocker. Archived from the original on 3 June 2011. Retrieved 11 January 2010. ^ Raymond McKenzie (1 December 2001). Public sculpture of Glasgow. ISBN 978-0-85323-937-6. Retrieved 29 December 2009. ^ "Deptford Town Hall, New Cross Road, New Cross, c. 1910". www.ideal-homes.org.uk. Archived from the original on 19 August 2008. Retrieved 29 December 2009. ^ "London-Footprints' Green Deptford Walk". London-footprints.co.uk. 16 June 1944. Retrieved 5 July 2010. ^ Dedication to the public of Deptford Park Archived 8 June 2011 at the Wayback Machine by William Job Collins, 7 June 1897, London County Council. ^ "National Rail Enquiries - Station Facilities for Deptford". www.nationalrail.co.uk. Retrieved 15 November 2009. ^ "Deptford Bridge". Transport for London. Retrieved 15 November 2009. ^ "Elverson Road". Transport for London. Retrieved 15 November 2009. ^ "Lewisham Council - Deptford station redelelopment plans". www.lewisham.gov.uk. Retrieved 19 December 2009. ^ "A200 - Roader's Digest: The SABRE Wiki". www.sabre-roads.org.uk. Retrieved 19 December 2009. ^ "A2 route - Roader's Digest: The SABRE Wiki". www.sabre-roads.org.uk. Retrieved 19 December 2009. ^ "A20 - Roader's Digest: The SABRE Wiki". www.sabre-roads.org.uk. Retrieved 19 December 2009. ^ "Quietway 1 (South) Waterloo to Greenwich" (PDF). Transport for London. 21 June 2018. ^ "Central London Cycling Grid: Quietway 14 – Results of public consultation" (PDF). Southwark Council. Retrieved 29 May 2016. ^ "Locator Search Results". www.streetmap.co.uk. Retrieved 30 December 2009. ^ "Deptford Green Secondary School Ofsted". www.ofsted.gov.uk. Retrieved 7 October 2014. ^ "Addey and Stanhope Ofsted". www.ofsted.gov.uk. Retrieved 7 October 2014. ^ "7623 LEWlife p6" (PDF). Archived from the original (PDF) on 18 July 2011. Retrieved 5 July 2010. ^ "Bazalgette and London's sewage - Leisure, health and housing - Port Cities". www.portcities.org.uk. Retrieved 19 December 2009. ^ "Lewisham Council - History of housing in the borough". Lewisham.gov.uk. Retrieved 5 July 2010. ^ "St John's, Deptford New Town Case Study". Ideal-homes.org.uk. Archived from the original on 25 April 2010. Retrieved 5 July 2010. ^ "Lewisham Council - Unitary Development Plan". .lewisham.gov.uk. Archived from the original on 27 September 2010. Retrieved 5 July 2010. ^ "Tanners Hill, Deptford, Lewisham, 1926". Ideal-homes.org.uk. Archived from the original on 13 June 2010. Retrieved 5 July 2010. ^ "Deptford". London-footprints.co.uk. Retrieved 5 July 2010. ^ "LOH Building Details". www.londonopenhouse.org. Archived from the original on 27 September 2011. Retrieved 19 December 2009. ^ "Diocese of Southwark - News: Christopher Marlowe Remembered at Deptford". Southwark.anglican.org. 24 January 2002. Archived from the original on 7 June 2011. Retrieved 5 July 2010. ^ "St.Paul's, Deptford - Official Site : Local History". Paulsdeptford.org.uk. Archived from the original on 18 September 2009. Retrieved 5 July 2010. ^ "St.Paul's, Deptford - Official Site : Home Page". Paulsdeptford.org.uk. Archived from the original on 8 July 2009. Retrieved 5 July 2010. ^ A Church Near You. "Deptford, Deptford, St Paul - London | Diocese of Southwark". Achurchnearyou.com. Retrieved 5 July 2010. ^ "Deptford and Woolwich: London's Royal Dockyards - The working Thames". Port Cities. Retrieved 5 July 2010. ^ "Samuel Pepys diary entry for 22 August 1665". Pepysdiary.com. Retrieved 5 July 2010. ^ "National Maritime Museum Research guide B5: Royal Naval Dockyards". Nmm.ac.uk. Archived from the original on 1 June 2010. Retrieved 1 May 2010. ^ "Rogers Stirk Harbour + Partners "Convoys Wharf Conception"". Richardrogers.co.uk. 15 December 2004. Archived from the original on 3 October 2009. Retrieved 5 July 2010. ^ "Safeguarded Wharves COVER" (PDF). Archived from the original (PDF) on 4 June 2011. Retrieved 5 July 2010. ^ Palladis Tamia. London, 1598: 286v-287r. ^ "BBC - BBC Radio 4 Programmes - In Our Time, Marlowe". www.bbc.co.uk. Retrieved 29 December 2009. ^ "Christopher Marlowe: Deptford Strand". www.lycos.com. Archived from the original on 14 March 2010. Retrieved 29 December 2009. ^ a b "The Coroner's Inquisition (Translation)". www.prst17z1.demon.co.uk. Retrieved 29 December 2009. ^ "News - 1623 Deptford Map Online". www.marlowe-society.org. Archived from the original on 13 May 2011. Retrieved 29 December 2009. ^ Charles Nicholl (2002). The Reckoning: The Murder of Christopher Marlowe. Random House. p. 18. ^ Gillian Darley (2006). John Evelyn: Living for Ingenuity. Yale University Press. p. 204. ^ Richard Tames (2006). London: A Cultural History. Oxford University Press. p. 45. ^ John Barrow (1861). Life, Voyages, and Exploits of Sir Francis Drake. John Murray. p. 74. ^ "JSTOR: International Labor and Working-Class History, No. 19 (Spring, 1981), pp. 65-69". www.jstor.org. Retrieved 2010-01-11. ^ "George Julian Harney". spartacus.schoolnet.co.uk. Retrieved 2010-01-11. ^ "Picturing the 18th-century port - Thames art, literature and architecture - Port Cities". www.portcities.org.uk. Retrieved 2010-01-11. ^ British and Irish paintings in ... - Google Books. books.google.com. Retrieved 2010-01-11. ^ "Henry Courtney Selous (1803-90): Illustrator of the Heroic". www.victorianweb.org. Retrieved 2010-01-11. ^ "Mark Knopfler and John Illsley of Dire Straits return to the Crossfield Estate, Deptford (From This Is Local London)". www.thisislocallondon.co.uk. Archived from the original on 4 June 2011. Retrieved 8 January 2010. ^ "They were in Dire Straits". www.shadyoldlady.com. Retrieved 9 January 2010. ^ "Bobby Valentino -Electric Bluebirds Sleeve Notes". www.bobbyvalentino.co.uk. Retrieved 9 January 2010. ^ Ross, Deborah (24 March 1997). "A few quiet words with Danny Baker boy". The Independent. London. Retrieved 9 January 2010. Wikimedia Commons has media related to Deptford. Wikisource has the text of the 1879 American Cyclopædia article Deptford. Prospects and phasing of proposed new railway station. Lewisham is a London borough in South London, England and forms part of Inner London. The principal settlement of the borough is Lewisham. The local authority is Lewisham London Borough Council and it is based in Catford. Lewisham, Deptford is a parliamentary constituency represented in the House of Commons of the UK Parliament since 2015 by Vicky Foxcroft of the Labour Party. 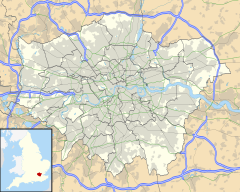 Lewisham is an area of south London, England, 5.9 miles (9.5 km) south-east of Charing Cross. The area is identified in the London Plan as one of 35 major centres in Greater London. Lewisham had a population of 60,573 in 2011. Deptford Bridge is a Docklands Light Railway (DLR) station in Deptford, London in England. The station is elevated above both local roads and Deptford Creek, and is adjacent to Lewisham College and Deptford market. The River Ravensbourne is a tributary of the River Thames in south London, England. It flows into the tidal River Thames at Deptford, where its tidal reach is known as Deptford Creek. The Metropolitan Borough of Deptford was a Metropolitan borough in the County of London between 1900 and 1965, when it became part of the London Borough of Lewisham along with the Metropolitan Borough of Lewisham. Lewisham East is a parliamentary constituency represented in the House of Commons of the UK Parliament since the by-election on 14 June 2018 by Janet Daby of the Labour Party. Addey and Stanhope School is a voluntary-aided, co-educational secondary school, located in Lewisham, London, England. It is a former grammar school and sixth form, with origins dating to 1606. The headmistress is currently Miss Jan Shapiro. Hatcham was a manor and later a chapelry in what is now London, England. It largely corresponds to the area around New Cross in the London Borough of Lewisham. Greenwich and Lewisham is a constituency represented in the London Assembly. St Johns is a name used to refer to Lewisham around the station of the same name in south-east London within the London Borough of Lewisham. It borders the Royal Borough of Greenwich. It makes up the northwestern part of Lewisham along with Telegraph Hill. Convoys Wharf, formerly called the King's Yard, is the site of Deptford Dockyard, the first of the Royal Dockyards, built on a riverside site in Deptford, by the River Thames in London, England. It was first developed in 1513 by Henry VIII to build vessels for the Royal Navy. Convoys Wharf also covers most of the site of Sayes Court manor house and gardens, home of diarist John Evelyn. HMS Lenox was a 70-gun third rate ship of the line of the Royal Navy, launched at Deptford Dockyard on 18 April 1678. Evelyn is an electoral ward in the northernmost part of the London Borough of Lewisham. It is located in the Deptford area on the south bank of the River Thames, and is the only Lewisham ward that borders the Thames. Occupying the northern corner of the London Borough of Lewisham, the Evelyn ward borders only one other Lewisham ward, which is New Cross to the south. But Evelyn borders wards from three other London Boroughs, Greenwich West in the Royal Borough of Greenwich to the east, Surrey Docks of the London Borough of Southwark to the northwest, and across the River Thames on the Isle of Dogs, the Millwall ward from the London Borough of Tower Hamlets. Sayes Court was a manor house and garden in Deptford, in the London Borough of Lewisham on the Thames Path and in the former parish of St Nicholas. Sayes Court once attracted throngs to visit its celebrated garden created by the seventeenth century diarist John Evelyn. Now completely buried beneath Convoys Wharf and Sayes Court Park, the area shows little sign of its former glory, despite having been a key factor in the creation of the National Trust. Deptford Dockyard was an important naval dockyard and base at Deptford on the River Thames, in what is now the London Borough of Lewisham, operated by the Royal Navy from the sixteenth to the nineteenth centuries. It built and maintained warships for 350 years, and many significant events and ships have been associated with it. Deptford St Nicholas was a civil parish in the metropolitan area of London, England. The creation of the parish accompanied the building of the Church of St Paul's, Deptford, constructed by the Commission for Building Fifty New Churches to meet the demands of the growing population. The ancient parish of Deptford was split in 1730 with the southern part around the new church becoming Deptford St Paul. St Nicholas parish included the old maritime settlement and the dockyard adjacent to the River Thames. Civil parish administration was in the hands of the vestry until 1855 when the parish was grouped into the Greenwich District and the parish elected vestrymen to Greenwich District Board of Works. The parish was transferred from the County of Kent to the County of London in 1889. It became part of the Metropolitan Borough of Greenwich in 1900 and the local authority became Greenwich Borough Council. The civil parish had only nominal existence until 1930 when it was abolished. The area became part of the London Borough of Greenwich in 1965 and following boundary changes in 1994, part of the former parish is now in the London Borough of Lewisham.